Free shipping for orders over $20. Darker in color and deeper in flavor, this harvest of coffee fruit tea hails from an esteemed El Salvadorean family farm that's been around for decades. This cascara tea reminds us of raisins and candied plums and has a full-bodied flavor with no lingering aftertaste or bitterness. The unique combination of healthy antioxidants, electrolytes, and natural caffeine in our premium coffee fruit teas is the best way to boost immune function, stay hydrated, and keep energized. The best part? No caffeine crash, just energy that lasts. 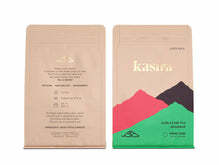 Every whole fruit KASIRA™ pouch contains 3.2oz of premium fruit tea to be brewed in the same way as a normal loose leaf tea. No hassle returns for all orders. Copyright © 2019 KASIRA all rights reserved.